Is our mask here to hide who we are… or to create who we are to become? We all have masks. Everyone has at least one, but most everyone wears a mix of many. It may be that we began to create these masks to become closer to the “Me” we wanted to be. Remember when we were kids in art class and we learned how to create something with paper mache’–usually a mask! Tearing piles and piles of small, skinny strips of newspaper and after dipping them in our “glue” of flour and water, we then started layering them, over and over again atop each other. Until finally, we had that shell of the mask dried to the perfect thickness, to hold just the right shape. We did not leave it there. We added paint then, and perhaps adornments like beads, fringe, glitter, anything we thought would make our mask unique, beautiful, different… our own. Somewhere down that road to “Me”-ness, we end up picking up peices of other people’s masks to add to our own. We looked at our friend, our neighbor and we liked what they had done with their mask, so we borrowed some of their ideas and added them to our own. Did we pick up those parts for our mask because we did not like our own or were afraid to show what our real mask looked like? Or did we pick those parts of the mask because we had a dream, a goal, a want to become something bigger than who we were? Who knew that exercise in art class all of those years ago would bring out thoughts on such a lesson in life as an adult. Is your mask there to hide who you are, or is your mask there to create who you are to become? As you layer the strips of paper for your “Me” mask and it begins to harden, do you like your own mask enough to share it? Do you love each layer as it is applied, adorned with your own touches, colors-soft or vibrant, glitzed or quiet, beaded or plain? I love the Shel Silverstein poem above. It helps remind me that maybe we should all show a little bit of our own blue skin in the mask that we wear and share everyday! 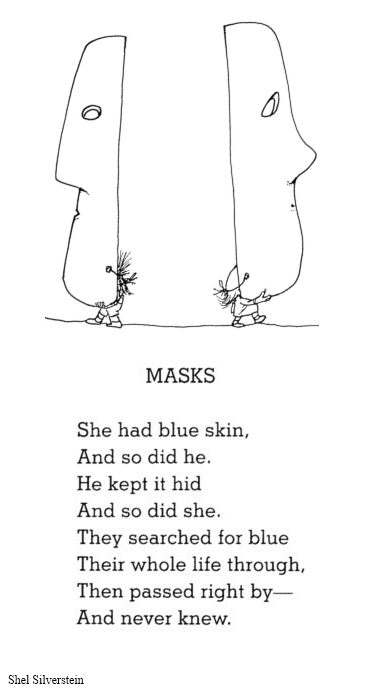 This entry was posted in inspiration, love, Uncategorized and tagged "me"-ness, art class, blue skin, masks, paper mache, searching, shel silverstein, shel silverstein poem. Bookmark the permalink.